When the nights are below freezing and the days are mild you can be sure of some things, like the coming of spring, the deadline for filing your tax returns and a new season of local harvesting. This seasonal change in the weather makes the sap flow and represents the region’s premier crop harvest of Maple Syrup. It usually takes about forty years before a Sugar Maple will reach the recommended tappable size of being 10 inches in diameter. The tap hole is usually placed about waist high on the tree, and 3 to 4” from any previous taps. It is bored 3″ into the sapwood. Larger trees may take numerous taps. For every additional 8″ in diameter another tap hole may be added. A tree 26″ in diameter could have up to three taps. I’ve been told that trees with lots of branches are better producers than those trees with smaller tops. During the 4-6 week syrup season, a single tap hole can yield up to ten gallons of sap or about one quart of maple syrup. After tapping the tree a metal spout called a spile is tapped snugly into the hole, and a bucket is hung from a hook on the spout. A cover is put on the bucket to keep out rain, snow, and debris. If a plastic tubing system is used to collect the sap, a plastic spout is tapped into the hole and is then connected to a network of tubes that creates a pipeline system. When all of the trees have been tapped, the syrup producer is ready for the “first run,” this is when the sap first starts to flow. Sap flow requires freezing nights and warm days. These must alternate and be in a long enough series to allow the sap to move through the trees. Prolonged periods of either below freezing temperatures or days without freezing nights will stop the sap flow. Maple sap comes from the tree as a clear, slightly sweet liquid that is approximately 98% water and 2% sugar. When the syrup is finished these ratios change to 33% water and 67% sugar. 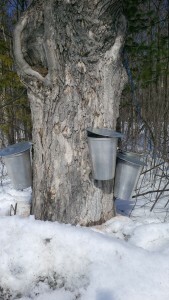 When the bucket collection method is used, a sap-gathering tank is mounted on a sled or a wagon that is moved through the sugar bush as the sap is gathered. Tractors are most regularly used, but sometimes teams of horses pull the sleds or wagons. Workers using large gathering pails collect the sap from each tree. These pails are dumped into the gathering tank, which is then taken to a large sap storage tank at the sugarhouse, where it will be boiled down into maple syrup. If the tubing system is being used, the sap drips from the tap hole into a section of tubing. This tubing eventually connects into a larger pipeline called a “mainline.” The mainline carries the sap downhill to a sap storage tank either at the sugarhouse, or at a low spot where it can be collected easily and transported to the sugarhouse. Maple syrup is traditionally made in a building called a sugarhouse or sugar shack. This name comes from the time when most sap was actually turned into sugar. It wasn’t until the late 1800’s when the drastic price reduction of cane sugar caused maple sugar sales to drop resulting in the production of the more profitable maple syrup. Each sugarhouse contains an evaporator that is used to boil down the sap into syrup. Evaporators are made up of one or more flat pans, which sit on a type of firebox. Wood or oil, and sometimes gas is burned at the front end, and the flames are drawn along the underside of the pan, heating and boiling the sap as it travels towards the back of the pan. It takes about one cord of wood or sixty gallons of oil to boil down 800 gallons of sap into syrup. Sugarhouses have a vent on their roofs, a cupola, which is opened to allow the steam of the boiling syrup to escape the building. Steam rising from the cupola is a signal that maple syrup season is under way. An evaporator pan is divided into partitions, so that the sap is continuously flowing through the pan. Fresh sap enters at the back of the pan, where a float valve keeps the sap about an inch deep. As the sap boils the liquid becomes sweeter, and begins to move towards the front of the pan, traveling through the partitions and more fresh sap is allowed into the rear of the pan. The syrup maker concentrates their attention to the front of the evaporator where the boiling sap is turning a golden colour as it approaches being maple syrup. The temperature of this boiling liquid must be checked regularly for when it reaches 7.5 °f above the boiling point of water, it has reached the proper density and has become maple syrup. At this stage a valve on the front of the pan is opened and some of the finished boiling syrup is drawn off the pan and is filtered. After filtering, the syrup is bottled and is ready for a fresh pile of warm pancakes. Last year I spent $200 on equipment and $60 on propane and was able to produce over 4-gallons of my own maple syrup. Considering that a gallon of syrup costs around $60 this is a very economical approach to enjoying maple syrup. The amount of work involved in making these 4-gallons was rather shocking and makes purchasing locally produced syrup seem like a bargain at $60 a gallon. If you have a few sugar maple trees, you can make your own maple syrup. I strongly recommend not boiling sap inside your house. Drill a 7/16″ hole 3″ deep at waist height into unblemished bark. Drive the spigot in so that it is tight and cannot be pulled out by hand, but don’t over do it and split the tree. Hang your bucket on the hook of the spout. Be sure to cover the bucket with a lid. Once the sap has started to run and you have enough in your buckets to fill your boiling pot two-thirds full, you are ready to fire up the burner. Do not overfill your pot, as it will boil over. As the water evaporates, add more sap to the pot. Do not have less than an inch of liquid in the pot as it may burn. You can add cold sap right into the boiling sap. It will take a lot of boiling to get it to become syrup. Remember that 40 gallons of sap make one gallon of maple syrup. Do not leave an accumulation of sap in the collecting buckets especially in warm weather, as the sap will sour. Keep the sap as cold as possible and boil it as soon as you can. Finished maple syrup will be 7.5 °f. above the temperature of boiling water at your elevation, check this with your candy thermometer. I like to use a hydrometer to tell me when my syrup is done. Proper syrup will weigh at least 11 pounds per gallon. Do not go beyond 11 1/4 pounds per gallon or it may form crystals in the bottom of the storage container. Pour finished hot syrup through a felt syrup filter or strainer. Sediment will settle to the bottom of the jars and clearer syrup may be carefully poured off the top. I leave the sediment in my syrup, as it is a concentration of calcium and other minerals. Pour the hot syrup into the clean, sterile canning jars and seal. Fill them full so that very little air will be in the jar. If laid on their side while cooling a better seal will result. Store syrup in a cool place. The freezer is ideal and properly prepared syrup will not freeze and a poor seal will not be as important when stored in a freezer. If proper taping procedures are followed, tapping will not endanger the health and vitality of your trees as a healthy sugar maple can provide sap every year for a hundred years or more. Posted on Sunday, February 19th, 2017 at 9:46 am	and is filed under Recipes.